Under the logic of the Constitutional Chamber, the legislators cannot reform the Organic Law of the Supreme Tribunal of Justice, but the Justices can modify the Internal and Debates Regulation of the National Assembly. So was recorded in the presentation by Justice and former deputy of the United Socialist Party of Venezuela (PSUV), Juan José Mendoza, who in a single stroke meddled in the Parliament’s inner life to restrict its autonomy. To top it off, Mendoza used a request from the opposition as a weapon against itself, applying a strange boomerang effect. On 9 March 2011, a group of deputies of the Democratic Unity Roundtable (MUD) went to the Supreme Tribunal of Justice to demand the annulment of a series of articles of the Internal Regulation “for reasons of unconstitutionality”. The Constitutional Chamber did not say anything about the MUD’s request. And so it remained – with the mouth closed – throughout the period 2011-2015, while the chavismo controlled the parliament. However, as soon as the opposition took over the majority in the parliament, the highest tribunal cleared the file and on 21 April 2016 issued a ruling (judgment 269) that restricts the Venezuelan Parliament’s performance. 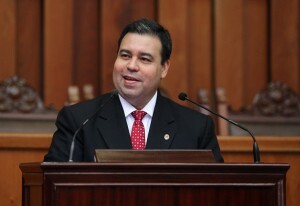 Mendoza claims the existence of “street parliamentarism” – a figure invented by chavismo – and establishes that “the period for public consultations will be at least twenty days, which according to the complexity and relevance of the subject referred in the draft bill presented, may be extended for a similar period, provided there are requests from the organizations that make up the People’s Power for the exercise of citizen participation”. Then, the representatives of the people will not be those who will set the pace and agenda of the National Assembly but the members of the “People’s Power”. The judgment goes further by forcing the parliament to submit its draft bills to the Executive for review, “for the purpose of determining their economic viability.” That is to say, the Presidency will exercise a previous control on the initiatives of the parliament and, at the end, of its analysis will depend that the texts can be discussed and sanctioned by the deputies. The Constitutional Chamber of the TSJ emphasizes the “mandatory nature” of its judgment, noting that “all acts that emanate from the national legislative body are called to comply with current regulations, especially the one concerning the involvement of the people in the Nation’s public affairs, as well as the intervention of the competent public body in matter of planning and budget on the economic impact of the law to be proposed”. The Legislative Branch introduced on 17 May 2016 a recourse before the highest tribunal to oppose the ruling promoted by Mendoza, recalling that “the Constitutional Chamber said nothing for five years on the precautionary measures requested in the nullity action, and only now, after five years, before the change of the correlation of political forces in the National Assembly, the Constitutional Chamber dictates the precautionary measures”. Despite this claim, the Supreme Tribunal in judgment 473 ratified his position on 14 June and, furthermore, ordered the parliament to report whether it was complying with the judgment, under penalty of imposing a fine of “up to 200 tax units (…), without prejudice to any criminal, civil, administrative or disciplinary sanctions that may arise”, using article 122 of the Organic Law of the TSJ. Rule that, according to the Justices, the deputies cannot touch. The Chamber makes a pronouncement carefully on the provisions in respect of which it has been requested to suspend its application, for which it observes that the process of formation of laws is provided for in the Constitution and developed in the Internal and Debates Regulation, mandatory application rule for the legislative body that has constitutional rank…” (…) “…Once the above has been established, it decides on the precautionary suspension requested regarding the articles 1; numerals 3 and 6 of article 27; 48 first section; 56 last section; and 64, numeral 4, of the contested Regulation, for which the text of those provisions has been revised, this Chamber The Chamber considers that they do not fulfill the necessary limits to settle the requested precautionary, since the constitutionality of sitting in the city of Caracas, or to estimate it in a different place, by agreement of the majority of its members or by decision of the Directorate; as well as the content of the aforementioned provisions, at this moment do not generate circumstances that make the requested precautionary suspension of those contested provisions of the Internal and Debates Regulation valid, which regulates as previously noted what concerns the form of action of the national legislative body for the process of formation of laws. This is how it is decided…”. Juan Carlos Caldera, Eduardo Gómez Sigala, María Corina Machado, Alfonso Marquina, Miguel Pizarro y Edgar Zambrano. 5 years, 1 month and 12 days. denies the precautionary measure of suspension of articles 1; numerals 3 and 6 of article 27; 48 first section; 56 last section; and 64, numeral 4, of the contested Regulation. 5.-AGREES- while the brought nullity action is decided- the precautionary measure of suspension of articles 25; 57; 64, numerals 5, 6 and 8; 73; and 105, last section of the National Assembly's Internal and Debates Regulation, in the terms expressed in the ruling's reason.